Briquetting plants are able to compact wood sawdust and almost any fine biomass materials at <14% moisture into high density round briquettes 60mm or 90mm in diameter ideally suited for gasification and combustion with output from 0.5-0.75 to 3-4.5 ton per hour. One or two silo bins each 25 m3 in capacity with upper charge port, level switches, bottom rotating auger and from one to three discharge ports. From one to three inclined metering screw conveyors with VFD connected to each silo bin discharge ports which feed the material into briquetting presses. 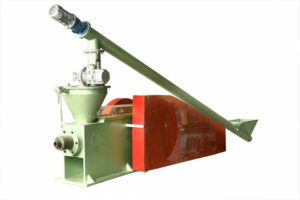 From one to three mechanical briquetting presses with specifications as shown in the table below connected each to metering screw conveyor. Briquette cooling line connected to each briquetting press which deliver finished briquettes into briquette storage area. Contact us to find out more and request a quotation for a grinding, drying, and briquetting plant or complete briquette line.